Bi-metal dial thermometers are simple to use, economical instruments that are easily within the reach of even the most modest budget. 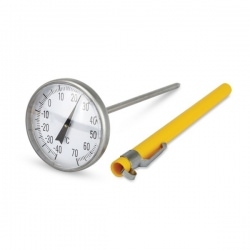 The thermometers are ideal for everyday use in a wide variety of applications, i.e. HVAC, construction industry, agriculture, food processing and many, many others. in the tip of the probe. The dial pipe and magnetic surface thermometers work in a similar way to the dial probe thermometers but the bi-metal coil is mounted directly behind the dial face so it is in close contact with the surface being measured. There are no batteries and minimal parts to wear out, therefore these thermometers are rugged and durable for everyday applications. Dial probe thermometers are easy to use. 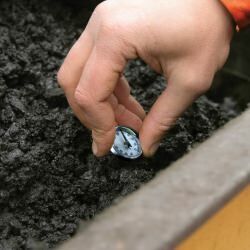 Simply insert at least 50mm into the liquid or semi-solid being measured to obtain an accurate reading. 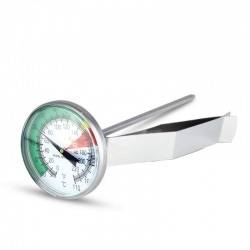 When inserting the dial probe thermometer into semi-solid or solid materials, such as frozen food or soil, it is important to insert the stem firmly and carefully to avoid bending the stem. It is advisable not to hold the head or dial when inserting - always use the stem. Each bi-metal dial thermometer meets an accuracy tolerance within 1% of the range over the full scale. As with all thermometers, it is important to periodically check the accuracy of the thermometers against a Reference thermometer or a certified thermometer with a known accuracy. In the unlikely event that your pocket-sized bi-metal probe thermometer requires adjusting, this can be done simply and easily by turning the hexagonal nut at the back of the dial. Please note: only the pocket-sized thermometers have this feature. 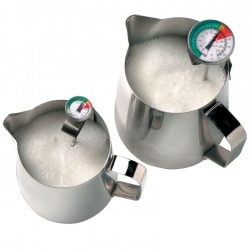 The bi-metal thermometers, available opposite, are just a small selection of sizes and ranges available. Where requirements cannot be met from the existing standard range, alternative designs can be manufactured. For advice on a specific bi-metal dial thermometer for a particular application, please contact the ETI technical sales team.